As many of you know, I love onions! We bought the most beautiful onions at the Farmers Market in Northport and I wanted to use them right away. 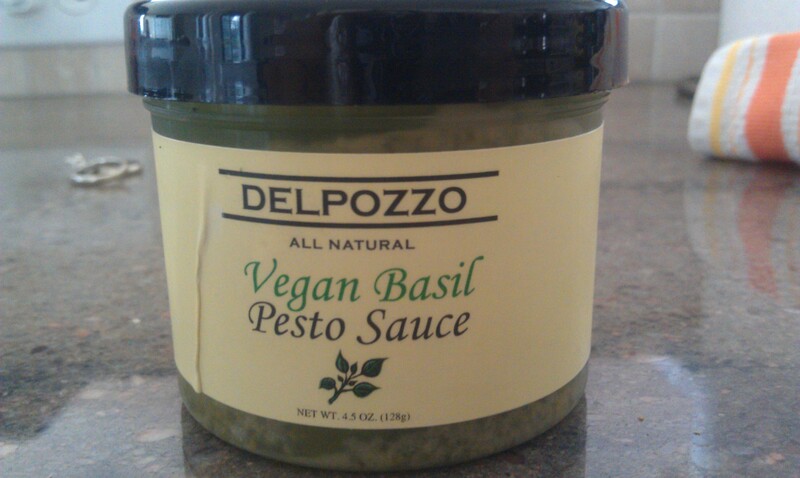 Lisa had this amazing Vegan Pesto from Delpozzo at the farmers market so it was just a perfect quick and easy beach meal to throw both these together with quinoa pasta. Easy Peasy! 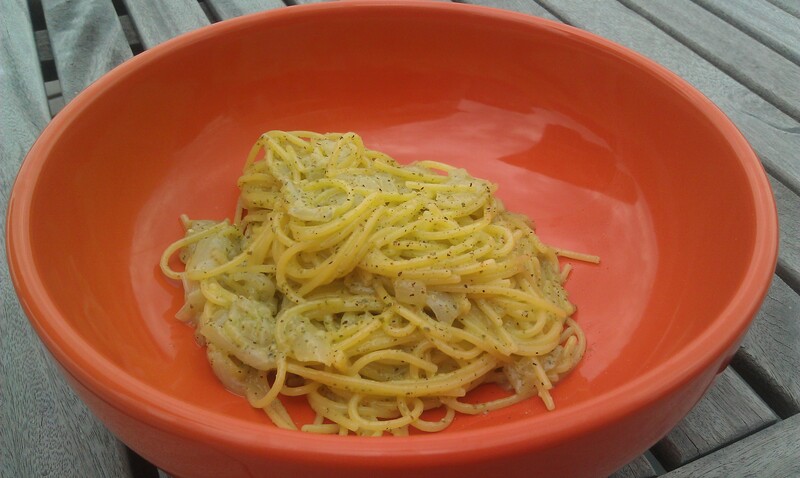 The pesto was Extra Virgin Olive Oil, Basil, Garlic, Pinenuts, Tofu, Salt and Pepper. Super easy! I have never tried tofu in the my pesto and this was out of control amazing! I usually make my pestos with olive oil, pinenuts (or sometimes other nuts), salt and pepper -occasionally I will add some nutritional yeast. I always like to try new things of course, so I am excited to experiment with this one soon myself. Caramelized onions are one of my favorite things ever. They come out so sweet and deelish!! All you have to do is cook them down and the sugar in the onions make them super sweet. Yum! 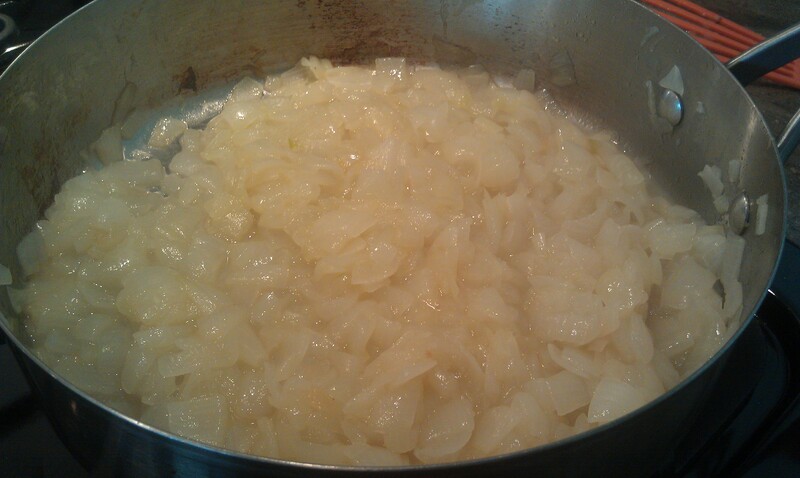 To caramelize the onions, just peel and chop the onions. Heat oil in a pan over medium heat and add the onions, stirring. Continue to let the onions cook for a while, stirring occasionally to make sure the onions don’t burn. You can either cover the onions with a lid and let their liquid cook themselves down or for a browner more caramelized version, keep the lid off and the liquid begins to evaporate as the onions begin to brown, just make sure you are stirring frequently to prevent them from burning. You can cook both versions for about 10-20 minutes till you reach your desired color and texture. After you get the onions in the pan, boil the pasta water. Add the pasta and cook according to instructions. I kept the cover on for the onions, so they are not as brown, but they are soft and super sweet! I LOVE it when it says Vegan on it!! So Special!!! love the rings in the background! looks like a great kitchen to cook in!!! haha yes 🙂 i caught my rings too!!! your kitchen is amazing to cook in!!! LOVE it and YOU! !